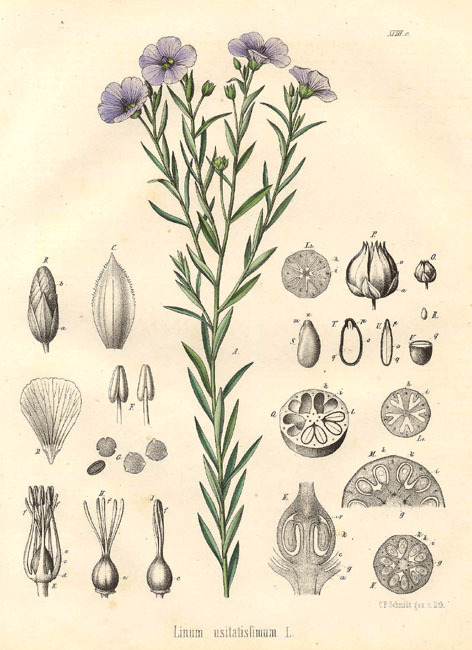 Linum usitatissiumum, usitatissiumum meaning ‘most useful’ or more commonly known - flax for food and linen for textiles. Glassy, grassy, crisp and heavy in hand - linen is a luxurious, long lasting, beautiful and yet highly practical fibre. Indeed, it is employed in everyday household textiles, in everyday as well as high end clothing fashions. Linen was and is used in the manufacture of sails and rope, in paper making, fragments of linen fibre from 8000 BC have even been found in Switzerland and it was amongst the very first plants to be domesticated in the Fertile Crescent. At one time, in by-gone Canada and the USA, currency was printed on linen and at other times linen was used as currency. In the past, linen had much more of an everyday presence in temperate climates. It’s functionality and long lasting nature lent (lends) itself to many a role. The words lingerie come from linen, linoleum, linseed oil comes from flax, oil paint arises from flax, there are even furniture designers using flax fibre to create the body of their pieces nowadays. Of course, flax is also highly nutritious, the seeds are used in baking and cereals, the oil is commonly and frequently taken as a supplement. Livestock food and bedding are also made from flax seed and unusable plant parts. Flax straw bales or pellets are increasingly being used as heating fuel for greenhouses, barns or agricultural kilns. Having said all of this, as is common practice in the farming and gardening world, there are specific species cultivated for fibre and another species for seed. Typically, the species grown for seed is a little shorter and produces more branches with flowers and ergo, seed. The species grown for fibre is taller and when grown close together, does not grow as many branches. Linen is a cellulosic fibre, the bast fibre of the plant is what we weave cloth with. To arrive to cloth form, linen starts in the soil as a flax seed. After a season growing in the field, the plant is then harvested, retted and scutched and finally, processed into usable yarn. Yarn that will last for decades and will in fact, only get better. Some of the highest quality, most gentle and soft, easy to clean handkerchiefs I’ve ever had the pleasure of using were 120 year old linen cloths bleached white by time and the power of the sun. Like all natural products the quality of linen fibre depends on the species, growing conditions and harvesting techniques; I tend to think of vanilla, wool, cotton, squash, hemp, beans, potatoes and even wool similarly! The bast fibre of linen runs from the very top of the plant unobstructed to the very end of the tap root. For this reason the highest quality linen is harvested by hand and pulled from the ground. On occasion linen stalks are cut at ground level. Following the harvest, the stalks must be retted; retted stemming from the word ‘rotted’. During the retting process bacteria decompose the ‘plant glue’ - lignin as well as the pectin (a complex polysaccharide component of the plants cell wall) content. Retting can occur in a few different ways, some in more frequent use that others. One very common method is to ret the linen in pools or specially built tanks of soft water; a smelly process but one that yields a useful layer of organic muck that can be used to fertilize fields for future cultivation. This is a fairly quick method of retting resulting in a light coloured linen. Because this method is so quick and often makes use of pools of stagnant water, the fibre can be ‘over-retted’. Over-retted material results in lower quality, brittle and weak fibre. Double retting also takes place in a tank, it is a slow process but results in a fine quality of linen. The fibre is removed from the tank half way through the ret, allowed to dry in the sun and air for a few months and returned to the tank for finishing. Stream retting is known to produce the best quality of linen fibre - bundles of linen are submerged in cool, soft running water for five to fifteen days, often depending on temperature. In this case, the water source must be clean and void of minerals, especially iron. As a natural dyer, I am familiar with the colour produced from iron and I do appreciate it, however, it will guarantee a change in colour from linens true colours of light blonde to blonde grey. The water down stream will be affected by organic matter fermenting and washing away from the bast fibres. Dew retting takes place plein air, on the grass. Flax stalks are simply spread in a thin layer, in a field and exposed to the weathering cycles. A natural process through and through! Through time, typically 4 to 8 weeks, and exposure to dew, rains and weather, fungi and bacteria, the pectin, lignin and other compounds of the plant are rotted away and in turn, returned to the earth beneath them. The layer of flax must be turned over during the retting period in order to expose all surfaces of the stalk evenly. Once the process is complete, the bast fibre left must be raked up and stacked to dry. Dew retting produces the coveted and my personal favourite shade of linen - silvery grey. Of course, there is a chemical retting process. Soda ash, oxalic soda and caustic soda are combined in warm or boiling water to create a chemical retting bath. The fibres are submersed for only 10 hours and then boiled for 30 minutes. The fibres must be rinsed with cold water to separate the fibres and fully dried to stop fermentation. This process will affect the strength and final colour of the linen. There is also the question of post-use water treatment, information I wasn’t able to obtain at the time of writing this. After all of this, the fibre still needs to be separated from the retted out stalks. Step 1 (or 3, depending on how you look at it) is scutching. Scutching is the beating and scraping of the dried stems to separate the bast fibre and shive, or bark and woody bits. Scutching is followed by hackling, a fine combing process either done by hand with hackling combs or industrially, in a hackling machine. It is the long, fine fibres left in the teeth of hackling combs that are finally spun into linen. Short bits of fibre leftover are also useful and referred to as ‘tow’. Tow linen is used for less expensive, more utilitarian type cloth. Although, any hand weaver who has worked with it knows that it can make a fine textile. After hackling, linen fibres are arranged into a continuous ribbon, called sliver, every fibre in alignment, and spun into long line linen. So, with this time intensive process and the beautiful yarns and fabrics produced from flax, it makes some sense then that linen is considered a luxury fibre in this day and age. Considering its quality characteristics though, I do wonder why linen isn’t employed more frequently. Linen is anti-bacterial and anti-fungal, hypoallergenic, biodegradable when it does finally wear out (as all natural fibres eventually do), it is cool to the touch (great for summer wearing), smooth and free of lint, it is breathable and strong. Linen improves and becomes softer with use, it is absorptive, taking up 20% its weight in water and yet, dries very quickly, linen is stronger wet than dry and resists dirt and stains. I have in fact, wiped something that I was sure would stain, right off of linen cloth (tablecloth, placemats, napkins anyone?!). Linen is conductive and can withstand very high temperatures and is unaffected by agitation. Linen does of course wrinkle. Wrinkling, inelasticity and breakage are due to it’s highly crystalline structure. Breakage can come to pass when linen fabric is folded repeatedly in the same place. Both the strength and weaknesses of linen come from the previously mentioned crystalline structure. However, it seems worth noting that linen can withstand heavy, repeated washing and much use over time due to this structure, the length of the linen polymer, the highly effective holding power of the matrix complex and its thick cell walls. The linen polymer is 18 000nm long making it the longest known linear textile polymer. Linen, even moreso than cotton, contains untold numbers of hydrogen bonds allowing it unyielding strength between polymers. So, although these polymers are highly crystalline and can break over time, they are disinclined to separate from one another along the length of the fibre. Linum, as a crop, does not require fertilizers, pest control or chemicals or even watering in most cases. Flax is grown mainly in Canada (predominantly for food at present) as well as in Russia, Ukraine, France, Argentina, Italy, Germany, Ireland, Scotland, England, Holland and Belgium, who boasts the finest quality fibre. Ireland, on the other hand, is known for the highest quality linen textiles. There is some flax production in India. China imports much of the worlds flax to process into linen yarns and fabrics. A common cloth finishing technique for linen is beetling or mangling. Beetling and mangling change linen fabric from its crisp loom state to a soft and lustrous material with a smooth, cool hand. Beetling is a process wherein the woven fabric is hammered or pounded; when linen cloth is mangled, it is rolled between two, usually aluminum, rollers under pressure. This pressure smooths and flattens the linen fibre and finishes the fabric. A beetling mill, no longer functioning. Linen won’t mould or allow fungus to grow within its fibre. Linen however, can be prone to cottonization. Cottonizing is a result of the laundering process when the alkaline hydrolysis of the waxes and gums that hold the flax fibre together occurs. When this happens, cell ends show on the surface of the linen fabric and causes a weakening of the textile. Fortunately, linen is easily bleached by the sun and often times, it is possible to wipe spills off of the surface of the fabric. Linen in the field: Authors own photo.